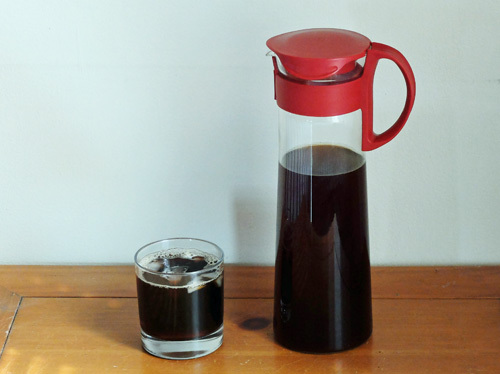 A demo of the Hario Mizudashi Cold Brew Coffee Pot. 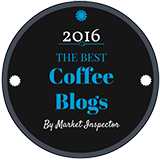 We have used a few different cold brew coffee systems over the years. Most recently we have been using the Toddy brewer. 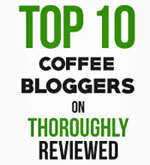 The Toddy is great, and makes a very concentrated coffee that goes a long way. But the Toddy is kind of big, and our kitchen isn’t. As for how it works, you simply fill the filter basket with about 110 grams of medium-coarse coffee grinds. That weight translates pretty much to filling the basket up to the level of the top of the filter screen material. Then add cold water slowly, stirring for the first few pours to make sure all the ground coffee gets equally wet and you get a good, even extraction. When the level of water gets to the top you’re ready to snap on the lid, put it in the fridge and leave everything to quietly brew for 12 to 18 hours. Once that time has passed, take out the filter over the sink and clean up. I put the used coffee grinds in my compost pile. Now you have a nice container of cold brew coffee which you can keep in the fridge for about a week, if you don’t drink it all sooner. 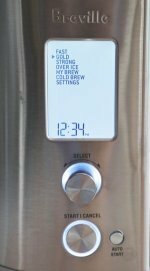 Why use a cold-brew system rather than just brewing with your regular drip brewer and then letting the coffee cool? Good question. And there’s a good answer too. When you brew coffee with cold water the flavor is extracted in such a way that the result is a little smoother and a whole lot less acidic. This is great for people who have sensitive stomachs and have trouble enjoying drip-brew coffee. In fact, if you have a problem with acidity in coffee, you can make all your coffee with a cold brew system. Pour yourself a cup of cold brew into a coffee mug in the morning and then heat it up in the microwave. I know, that doesn’t sound like a very “gourmet” way to brew coffee, but it works just fine for your morning cup of Joe. You’ll probably have trouble finding the Hario Mizudashi Cold Brew Coffee Pot in a local store, as it comes from Japan. But you can get it from Amazon. You can see our video review of the Toddy cold brew coffee system here. A nice glass of cold brew coffee with ice, courtesy of the Hario Mizudashi Cold Brew Coffee Pot.